Middle School Science Fair Projects: If only it was all this simple! Middle school science fair projects shouldn't make you run in fear! So...your teacher told your class about your middle school science fair projects. But you waited...and waited...and waited. Now, your first assignment is due on Monday...and you have nothing! Well, OK. Maybe that isn't how it is with you. Maybe you've been diligent and you did you research. You found our page the night after your teacher assigned your project. But you still need help coming up with an award winning project. Because you want to do your best...with as little effort as possible that is. Well, you've come to the right place! ...by the way, it's not too difficult — it can even be (gasp!) fun to learn something. We highly recommend you read the entire tutorial on this page before scrolling down to the bottom to find great science fair projects. Follow these steps, and you'll have a great chance of doing well! We've boiled these steps (called the "scientific method") down to four categories for all middle school science fair projects. These four steps make it easier to understand the many steps listed below. That's why we used the steps above. We want to make it as easy as possible! First, choose a topic that gets you excited. Find good middle school science fair projects that you think are interesting and choose one. A good project needs to be something interesting. Don't choose something that you "hafta do." Choose something on your level that will make you jump and shout when you win that blue ribbon! Ask the librarian if you're not sure where to start. She may be able to help you with your middle school science fair projects. To help you with your research we'll give you special people and places you might want to look for information. 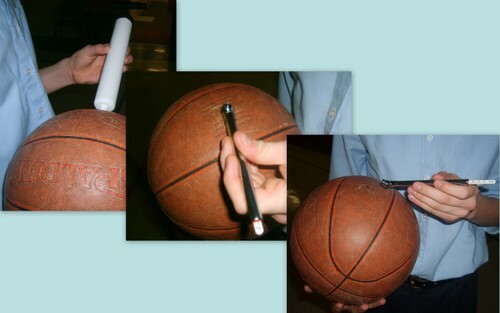 Speak to your school's basketball coach about what basketballs are made of. Third, develop a question that you think might be good for a science fair question. This question is what your project is all about. Your whole project should have this idea in it. You should come up with a question that you can test. Write down this question because you'll need it later. Does the floor surface make a difference as to how the ball bounces? Don't forget. Your whole project will use this question. So don't forget to write it down! Don't let this word scare you. It's only the answer that you guessed about your important question. In fact you should write it down next to your important question. Don't change it! Even if during the experiment you think it's wrong, don't change it! Fifth, plan the steps how you're going to pull this whole thing off. You need to have some kind of written plan so you know what you're doing. 1. Call different gyms to get permission to use their floors. 2. Ask mom and dad for permission to visit these places. 3. Make sure your paper, pens, basketballs and other supplies are gathered for the trip. First, you will use it later when you make a display. Second, it helps make sure you don't forget something when you do the next steps. 6. Three different floor surfaces. When you're done, gather the items on your list. If you think the project is too hard, this is where to stop and find another. Pretty much, you won't be able to look back from here. Seventh, test that important question. Do as much as safely possible having someone older help with anything that may be hard to do. Take lots of photos. You guessed right! You'll use them later. Write the results neatly on a piece of paper. You will use them later as well. Eighth, retest your hypothesis by doing the experiment again just like you did it the first time. This is an important part of the scientific method! You want to make sure of your results. So do it again. Do it as many times as necessary. Why did it not work? Was it something I did wrong? Make sure you know why it did what it did. You can't go on until you know and understand what happened. Tenth, chart or graph what you found. We have great pages to help you with this if you don't know how to do them. Just click here to find out about charts and graphs that are bound to help with any middle school science fair project. Eleventh, write the report. Do this the way your school requires. Pay special attention to the science fair guidelines you received. If you were not given specific requirements, write one or two paragraphs per grade level. If you need help, use some of these sentence starters. My science fair project is about__. I wanted to find out __. It's important that you include your question, hypothesis and results. Don't forget these. Without them middle school science fair projects would just be...science experiments! Make sure to include at least one graph or chart if your project lets you do that. Judges love to see graphs and charts. So try to include one if at all possible. Twelfth, prepare the science fair project display. Now, gather everything you wrote down. Type or neatly copy the things you wrote. You will want to buy or make a display board that fits the dimensions your school requires. Make labels with words like "question," "hypothesis," "supplies," "test," "results," and "report" on them. There are other ideas in the example below. Practice different layouts. Find a layout that you like. 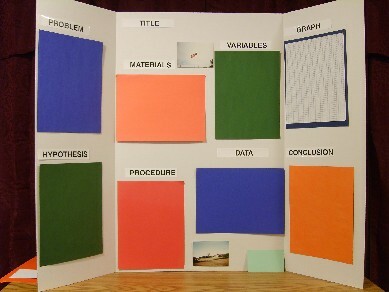 Neatly attach the titles, pages, and photos to the science fair project display. Prepare any samples to set on the table in front of your display. If your school requires a speech, practice telling what you did several times. And enjoy the science fair. Be a good sportsman. For layout ideas, display information, help for your report and all other things to help with middle school science fair projects click here. We're sure you'll find many great middle school science fair projects here to do. And hopefully you'll find one that will help you win! That's about it. Click on the links below and you're on your way with great middle school science fair projects! Finished with middle school science fair projects? Click here for the homepage.